I Left My Heart - . I was standing in the kitchen this evening making a little 10:00pm coffee. While I waited I took some time to really stare at this little treasure. The previous owner left this hanging on a wall near where we keep the coffeemaker. I have always been in love with it. It doesn't belong to me, it belongs to this house. 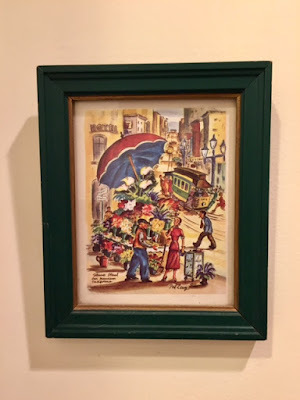 This little flower stand scene in San Francisco is drawn by Ted Lewy, a man from Prussia who traveled to San Francisco in the 1950s and fell in love with the city. He has painted many other scenes, most often of nature and architecture of the west coast. Perhaps because I grew up in Northern California, this particular little scene is especially dear to me. As the coffee brews, I take a step inside the picture and imagine what Ted Lewy's early 50s San Francisco might have looked and felt like. I know the sound there - the clanging of cable cars, traffic, seagulls. The smell of saltwater and the cool damp of the fog sitting on your skin. I am the lady dressed in red, buying yellow roses from a man with a cap, my hand inside a glove, clinging to my pocketbook. And then, my coffee is ready. I can relate to the memories that picture brings. Once upon a time the green & white cable cars passed my grandparents apartment by Lafayette Park.